As a rule with cookies in general, I have yet find one I haven’t liked. But I think we all can agree that some are better than others. And thus begins the great cookie debate. I used to swear by the NYT recipe for chocolate chip cookies, but I am now a convert to this recipe. Tested time after time in America’s Test Kitchen, this recipe is that good, I promise, and the secret is all in the butter. Set your oven to 375 degrees and place oven rack on middle shelf. Line 2 large baking sheets with parchment paper. In a medium sized bowl whisk together flour and baking soda; then set aside. Melt 10 tablespoons of butter in a large skillet over medium-high heat. continue cooking, stirring constantly, until the butter is dark golden brown (1-3 minutes). Then pour the butter into a heat resistant bowl and add the unmelted 4 tablespoons. Stir until completely melted. Add brown sugar, granulated sugar, salt, and vanilla; whisk until fully incorporated. Add egg and yolk; whisk until mixture is smooth with no sugar lumps remaining. Let mixture stand for 3 minutes, whisk again for 30 seconds. Repeat process 2 times, then mixture will be thick, smooth, and shiny. Using a rubber spatula, fold in the flour mixture; stir until combined (about 1 minute). Then stir in chocolate chips. Working dough into balls (about 3 tablespoons, so larger than you are used to), place 2 inches apart on prepared baking sheets. Bake 1 sheet at a time until cookies are golden brown, still puffy, and edges have begun to set but centers are soft. 10-14 minutes, rotating baking sheet halfway through baking. Transfer to wire rack to cool. Share and enjoy!! P.S. do you read Cook’s Illustrated? You should. A visit to America’s Test Kitchen is on my bucket list. 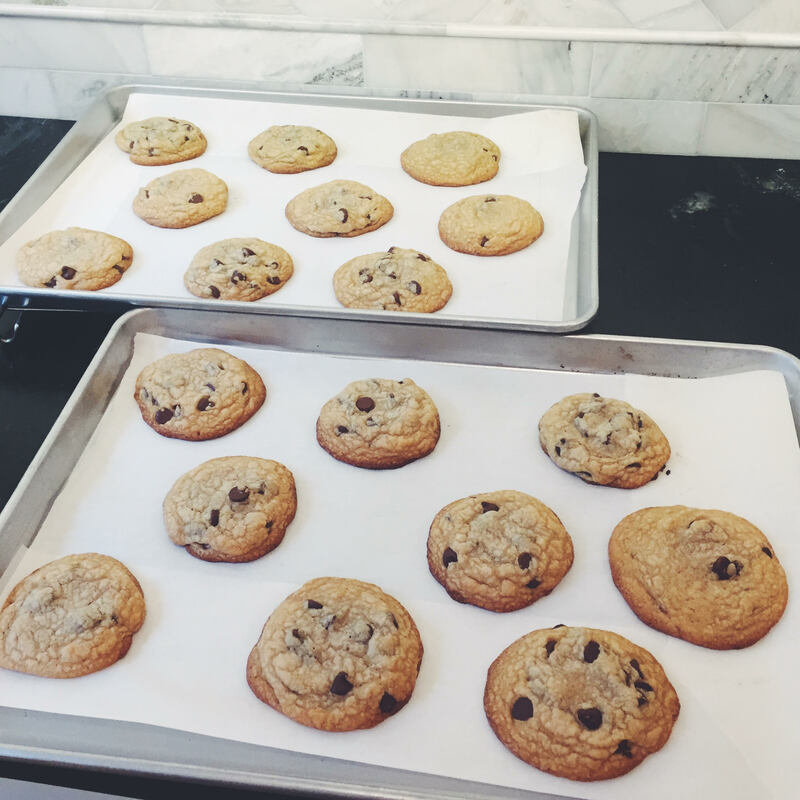 This entry was posted in baking and tagged baking, cook's illustrated, cookies, perfect chocolate chip cookie. Bookmark the permalink. Taste even better than they look!! A few walnut pieces next time!